Nicole A. Carlton, Commissioner, Division of Emergency Medical Service, is responsible for the oversight of approximately 261 employees and an annual budget of more than $22 million. The Division of Emergency Medical Service (EMS) is the primary provider of advanced life support pre-hospital medical care in the City of Cleveland, transporting more than 70,000 patients annually. Cleveland EMS responds to over 100,000 medical calls for service and is recognized as one of the premier EMS systems in the country. 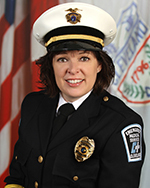 Commissioner Carlton began her career with the City in 1993 as an Emergency Medical Technician (EMT), and was assigned to the ambulance and the communication’s center. She has worked in the positions of Communications Center Crew Chief and as Communication’s Section Quality Assurance Sergeant. She oversaw the civilianization of the communications center where she assumed a lead training role in the extensive training and quality assurance of the civilian Emergency Medical Dispatchers (EMDs). She was appointed to the Community Education and Training Section, and implemented the City’s Public Access to Defibrillation Program through initial training and installation of the first AEDs in the City-owned buildings including Cleveland Hopkins International Airport. She pursued the vision to improve the Community Education Program by extensively expanding the health screening and public education programs. Commissioner Carlton laid the foundation for the current level of programs that resulted in the Community Education and Training Section becoming the City of Cleveland’s most visible and utilized free health education and screening program. In January, 2003, she was promoted to the position of Field Operations Captain, where she oversaw the field ambulances and communication’s center. She was then appointed to the position of Deputy Commissioner of Operations in February, 2004. As the Deputy Commissioner of Operations, she oversaw daily operations of the division and was directly responsible for staffing personnel, communications, supply/logistics, budget, hiring, supervision, discipline, and retention of personnel, as well as equipment, resource allocation, development, implementation and enforcement of policies and procedures. Under her guidance and leadership, the Division of EMS implemented state-of-the-art electronic patient care reporting and Mobile Data terminals in all response vehicles resulting in decreased response time to emergency calls. Under Commissioner Carlton’s leadership, the Division of EMS continues to provide quality pre-hospital care by utilizing state-of-the-art technology which includes an electronic pen-based run report system, which integrates CAD, I-Mobile and Automatic Vehicle Locator systems to continually increase operational efficiency. The Division of EMS continuously strives to improve the quality of patient care by providing pre-hospital care continuing education programs and a quality assurance program under the direction of the Department of Public Safety Physician’s Advisory Board. The Community Education program reaches more than 20,000 people annually with blood pressure, glucose screenings, cholesterol level checks and CPR/AED/First Aid training. Carlton lives in the City of Cleveland’s Old Brooklyn neighborhood with her children, Joshua and Victoria.